Hello all, and Happy Valentine’s Day! I’m proud to say I’ve teamed up with two talented writers to help form the Paper Animals Collective! There’s three of us as of now, and we’re using this collective as a platform to publish poems, short stories, and novels together! 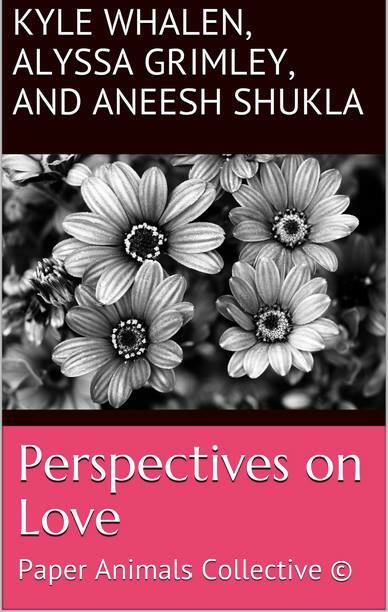 For our debut piece, we’ve released a collection of three short stories called Perspectives on Love. Each of us explores a different theme– Kyle did “love and loss,” I did “unexpected love,” and Aneesh did “young love.” It’s available now on Kindle, and will be released to iBooks as well. Click here to check it out! Novel update: It’s close, oh so close. The goal was to get it to you by the end of 2013, but the end of 2013 was a crazy time. Keep your beautiful eyes peeled– I promise you’ll be seeing it soon. Stray observation: Teen Girl Squad is still funny. What time is it? It’s Valentimes. For more updates on our writer’s collective, you can like us on Facebook or follow us on Twitter! This entry was posted in Books and tagged Happy Valentine's Day, paper animals collective, perspectives on love, short stories, teen girl squad, valentines day. Bookmark the permalink.